This charming, smiling Monkey Rattle from Zubels is perfect for newborns and toddlers alike. At 7.5 inches tall it’s a great addition to an eco-friendly plush collection — and the soft, tinkling rattle inside makes it a sweet gift for babies too. The monkey is hand knit by Peruvian artisans under Fair Trade practices. To double the fun, go for both the boy and girl versions — a match made in monkey heaven. 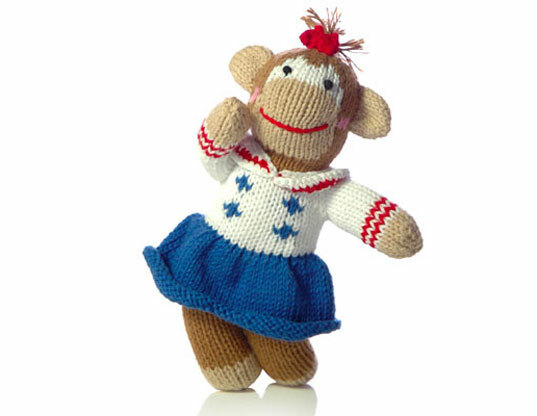 This charming, smiling Monkey Rattle from Zubels is perfect for newborns and toddlers alike. At 7.5 inches tall it's a great addition to an eco-friendly plush collection -- and the soft, tinkling rattle inside makes it a sweet gift for babies too. The monkey is hand knit by Peruvian artisans under Fair Trade practices. To double the fun, go for both the boy and girl versions -- a match made in monkey heaven.